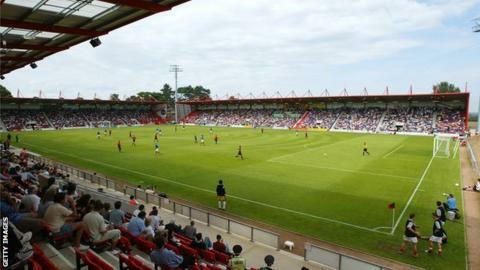 AFC Bournemouth chairman Eddie Mitchell confronted supporters calling for the dismissal of manager Paul Groves after Saturday's 2-1 home defeat by Walsall. In a video uploaded to a fansite, Mitchell spoke calmly with fans before the discussion became heated and a programme was thrown from the crowd. The Cherries have won just one of nine League One matches, and have only taken one point from 15 at the Goldsands. Groves received public backing from the chairman in the build-up to the game. The former Grimsby and West Ham coach was appointed as successor to Lee Bradbury, who was sacked by the club in March 2012.